Every living thing needs energy. Plants and some microorganisms use the process of photosynthesis to directly capture the energy of sunlight to meet this need. These organisms are called autotrophs, meaning “self-feeders.” Almost all other organisms rely on “eating” energy-containing organic matter produced by the autotrophs (see a previous Naturalist’s Note, “What’s the Yucky Stuff in the Creek” to read about one exception). These creatures are called heterotrophs, which roughly means “feeding on others.” Heterotrophs might eat autotrophs or other heterotrophs. How does the energy move through the forest? Ecologists have long been interested in studying how energy flows through the whole complex of autotrophs and heterotrophs in the forest. In “the old days” we were taught about food chains. In a food chain, trees captured the energy of the sun, and produced seeds, squirrels ate the seeds, and then hawks ate the squirrels. That’s correct as far as it goes, but is a bit too linear. Scientists now advocate a concept they call a “food web.” It’s pretty much the same idea, but recognizes that lots of heterotrophs have a varied diet and that a linear chain is too simplistic. For example, a tree produces seeds and a thimbleberry produces leaves. The seeds are eaten by squirrels. The leaves are eaten by insects. Birds eat the insects, and owls eat both the birds and the squirrels. For simplicity, in this posting I’ll stick with the food chain concept. Each organism is the source of energy for the next organism up the food chain. However, there is one big factor to consider. Every organism uses up a certain amount of the energy it acquires to perform vital functions which might include staying warm or moving around. This “maintenance” energy is being used, or lost, at every level in the food chain. Thus, there is more energy available to the insects eating the plants than there is to birds eating the insects. What effect does this maintenance energy loss have? The most obvious effect of energy loss at each level in the food chain is that there is “more” of the organisms at the lower level of the food chain than at the upper level. Let’s look at a simple food chain at Tryon Creek State Natural Area (TCSNA). For this example I’ll use the chain of plant-worm-mole-owl. At the very bottom, think of it as the “foundation,” are plants, which capture solar energy to make sugar. 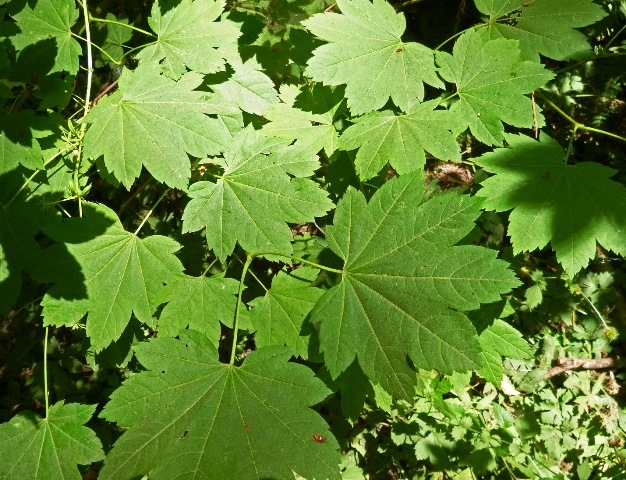 One example at TCSNA is the vine maple shown below. The next step is the earthworms, pictured below, which feed on dead plant matter. 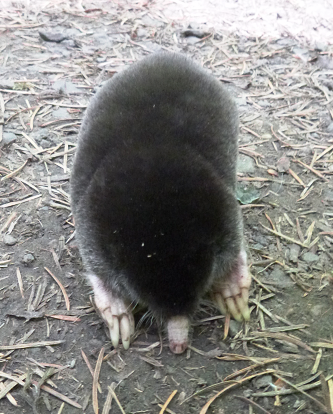 The next step in our example is a mole, which eats the earthworms. The next link in the chain is an owl. This owl’s ready for a nice mole dinner! To recap, our sample food chain is: plants capture energy from the sun, worms eat dead plant material, moles eat worms and owls eat moles. Owls are an example of what’s called an “apex predator,” meaning it is at the top of the food chain. 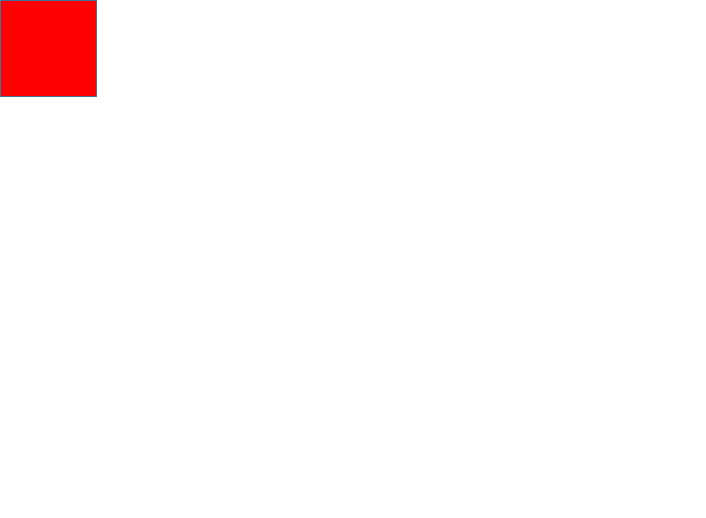 Click on the owl’s picture to reveal a different perspective on owls. 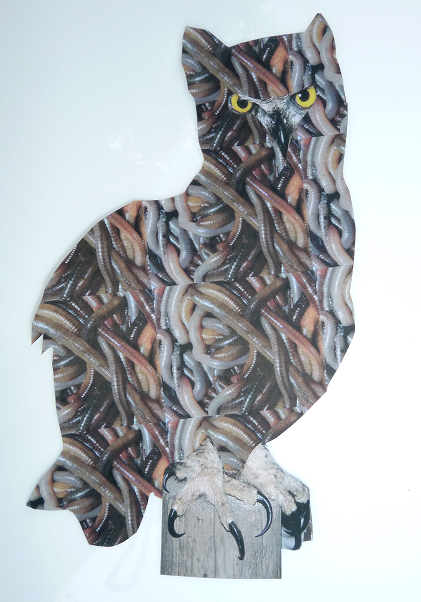 An owl is just earthworms which have been reconfigured to fly. How does the “maintenance energy” loss effect the food chain? As mentioned above, each link in the food chain uses up some of the energy it captures just to stay alive. So each link up the food chain contains less biomass (weight) than the link just below it. It is useful to think in terms of biomass per unit area of land. For this discussion, the area of land is TCSNA. Based on recent TCSNA citizen science project owl numbers (thanks to Matthew Collins), and the estimates of weights of the different species, there are approximately 20 lbs. of owls living at TCSNA. They are represented by this red square with an area of 1 square inch. Biomass numbers for some of the forest organisms aren’t easy to come by. Apparently everyone figures they had something better to do than find out how many pounds of moles there are in an acre of forest. So instead of moles, I’ll use some biomass numbers for mice found in a study at the H. J. Andrews Experimental Forest near Corvallis. Owls eat mice, and other things, as well as moles. Using the same scale as the red square for the owls, the weight of mice at TCSNA is estimated at 506 lbs. 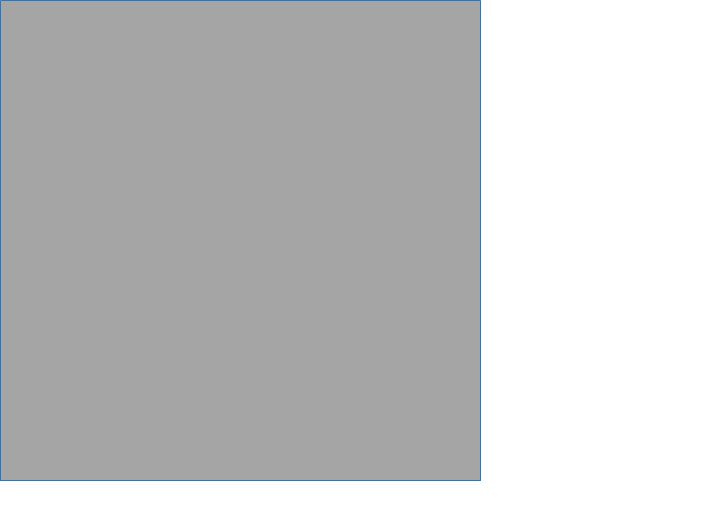 It is represented by the gray square below. One caution should be noted. The biomass numbers always represent just one point in time (“the standing crop” in ecology-speak). In reality, these mice are constantly having babies and some of the babies and adults are constantly being eaten. Therefore, over the course of the year, the heterotrophs of TCSNA probably have the opportunity to eat a lot more than 506 lbs. of mice. Numbers for the standing crop of worms that I could find were so wildly variable, that I decided to skip those. Extrapolating from plant biomass data collected at several Pacific Northwest forests, there are approximately 197 million lbs. of trees and shrubs at TCSNA. Using the same scale as for the owls and mice, this would be a square approximately the area of 6 or 7 average city lots. Think about cutting out the 1 inch red square representing owls, and laying it out on your front yard, and comparing the size of that red square to the sum total of the sizes of your lot, your neighbor’s lots on both sides, and the three lots across the street. When comparing the biomass of the plants to the biomass of the owls, owls almost don’t exist. But owls are the top of the food chain, right? As I said before, owls are considered to be an apex predator in our forest. In an area the size of TCSNA they would provide very little food for the next link up the chain. In order for a predator to survive by eating owls, it would have to cover a huge territory to get enough food. Think of a good size hawk hunting over a big chunk of the Willamette Valley! We’ve probably all watched too many movies of lions killing gazelles on the plains of Africa. This has created a sense of “prey” and “predator” that has limited usefulness when we think about the flow of energy in an ecosystem. Rather than think about a large owl-eating predator that covers huge areas, let’s look at an alternative. Since there are only enough owls to support a small weight of the next level up the food chain, what if the organisms at the next level of the food chain were really small? 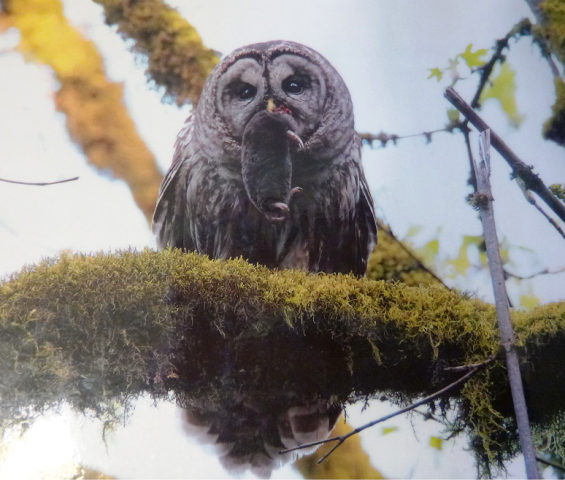 When scientists studied owls in northern Idaho, they found something very interesting! 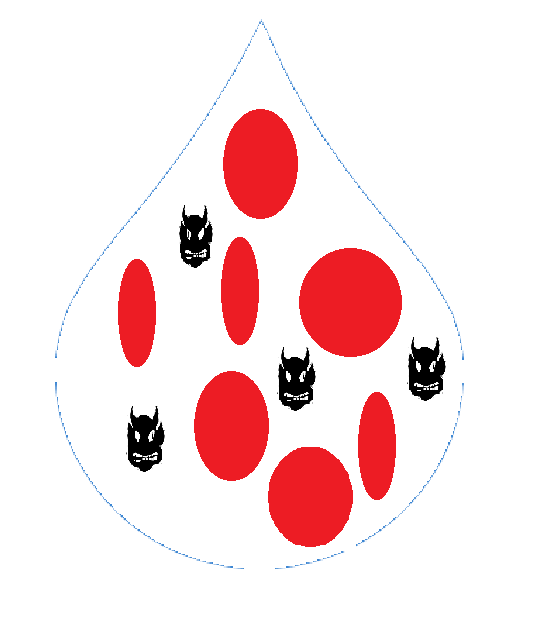 Click on the blood drop below to find out what the scientists discovered. That’s right, blood parasites were found in more than half of the northern saw-whet owls (a species we have at TCSNA). The parasites were getting energy from the owl’s blood. This isn’t the traditional view of “eating” something, but for energy flow purposes, it’s the same thing. The biomass of the blood parasites that are probably in owls at TCSNA is incredibly small, which fits into the pattern we have seen so far in the food chain. I am reluctant to declare that the blood parasites are the final link in the energy flow of our forest. However I will stop here, you get the idea! All organisms in the forest need energy. As you can see, Mother Nature has been very creative in developing a variety of ways in which energy flows through our ecosystem. Enjoy the many manifestations of that energy as you, a child of the sun, hike through TCSNA. Tryon Creek State Natural Area (TCSNA) supports its share of fantastic fungi. Our fungi are very diverse in size, shape, color and life style. With the coming of fall, when fungal fruiting often peaks, it’s a good time to get better acquainted with TCSNA’s fungi. Fungi are amazing. They are one of the most diverse groups of organisms in the world. There are estimated to be over 5 million species of fungus worldwide. In contrast, there are estimated to be fewer than 1 million species of insects, and only about 10,000 species of birds and a paltry 5,500 species of mammals. Strangely enough, a fungus lays claim to being the largest organism in the world. A single fungus found in the Blue Mountains of Oregon extends over more than 4 square miles! Yikes! We’ve got lots of mushrooms, right? Yes we do! Mushrooms are the most common, and obvious, part of fungi at TCSNA. 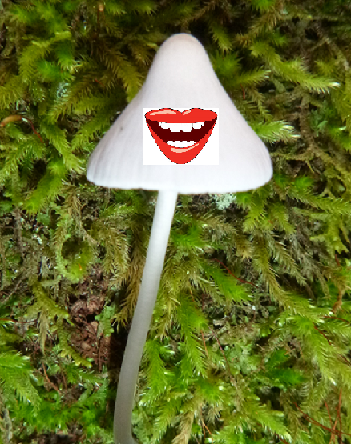 The one pictured below is the typical umbrella-shaped mushroom we all recognize. 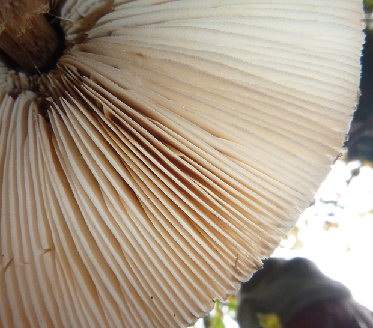 In the side view of a mushroom cut open below, you get a different perspective on the gills. 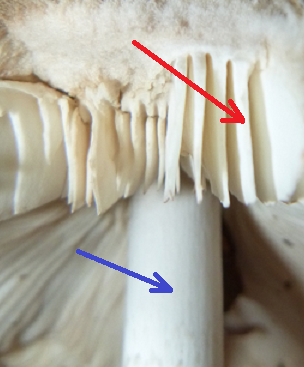 The red arrow points to a single gill, and the blue arrow points to the mushroom stem. How does the fungus get its food? A mushroom ready to start chewing. So at night, when no one’s looking, they just bend over and grab a big bite of….. No wait! That’s not true! Fungi don’t have mouths! Let’s start over on how mushrooms “eat”. Mushrooms, instead of being a “fruit” nourished by a system of leaves, twigs, branches, stems and roots, are fruiting bodies that get nourishment from their hyphae. The hyphae are long, thin, living threads that grow in soil or wood, or on those strawberries you left out on the counter too long. Collectively, they are known as mycelium. 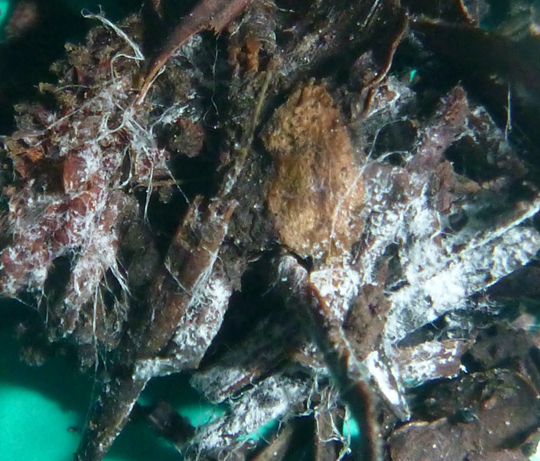 Below is a typical bunch of hyphae that were found amongst some decaying leaves and twigs at TCSNA. White strands of fungal hyphae growing in organic matter from the forest floor. But wait, there’s not any mouths on these hyphae either. How does the food get from the organic matter into the fungus? The answer to that is simple; extra-cellular digestion. That means the fungal mycelium secretes digestive enzymes into the organic matter, which break down large molecules into smaller molecules. These smaller molecules are then absorbed by the hyphae, and provide nourishment for the fungus. Cool! But what other kinds of fungi can we find? Another really common type of fungal fruiting body that we can see in the forest is called bracket or shelf fungus, often referred to as “conks”. These conks are flat-ish to horse-hoof shaped objects sticking out of the sides of trees or logs. These can range in size from one inch up to at least two feet across in rare cases. 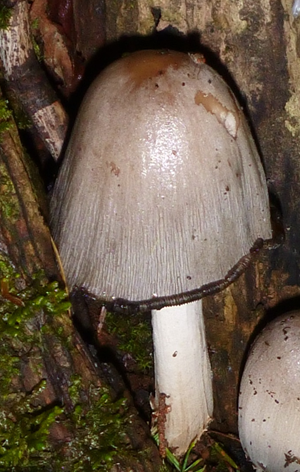 There are many different species of fungi that produce conks at TCSNA. One common example is the red and gold beauty shown below. 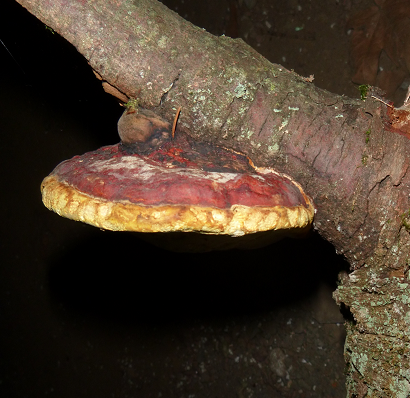 Conk growing on a tree branch. 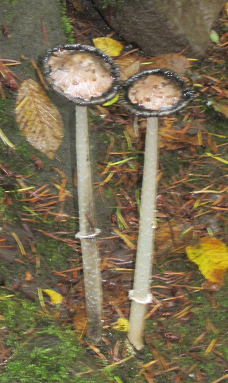 These conks are different in several ways from the typical umbrella-shaped mushroom that was pictured above. For one thing, conks don’t have gills! They grow their spores in tiny tubes. If you look very carefully at the underside of the conk pictured above you can see round holes which are the ends of these tiny tubes. 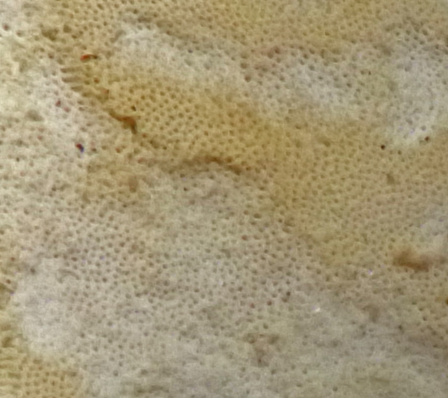 Ends of spore-bearing tubes in a conk. Tubes vs. gills, cool! What else is different? If you like to cook with mushrooms, you know they have a fairly short shelf-life. This is another huge difference between some of the fungi we see at TCSNA. The life spans of the fungal fruiting bodies vary tremendously. Most mushrooms have a fairly short life. Their job is to make spores. When they are done, that’s it! In fact, one group of mushrooms, generically known as “inky caps” takes it to an extreme. The inky cap mushroom produces spores, and then the mushroom cap starts to dissolve into “ink”. As it dissolves, it releases the spores into the environment. Some inky cap mushrooms are reported to totally dissolve in 24 hours, although my personal experience suggests it can be a little slower than that. In the photo below, the mushroom cap has just started to dissolve. As it dissolves, the cap curls back and turns into black goo, starting from the edge and working steadily upwards. An inky cap mushroom with a black curled edge where the cap is starting to dissolve. Inky cap mushrooms with the caps almost completely dissolved away. 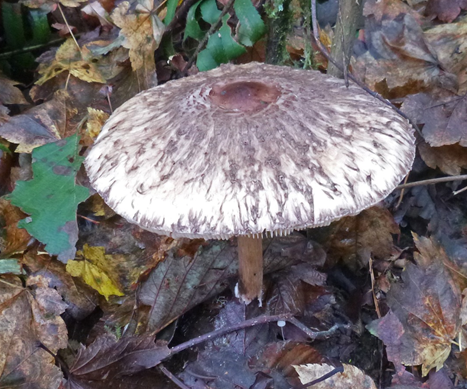 On the other hand, conks tend to be hard woody structures that in many species are perennial. Each year they produce a new layer of tubes, which produces a new crop of spores. They can persist for years. Look back at the red and gold conk pictured earlier. When we cut vertically through one of those conks we can see they have layers. So just like counting rings on a tree, you can tell how old an individual conk is by counting layers. However, be careful because some conks produce two layers per year, one is the layer containing all the spore-bearing tubes, and the other layer is tissue that supports the tube layer. So while the layers in the conk are indicative of how old it is, determining age is not as straightforward as counting tree rings. 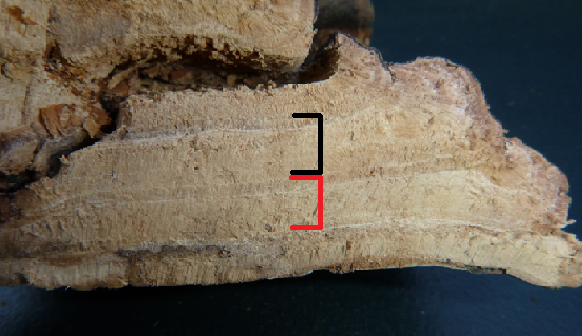 This perennial conk show its age by layers, two of which are highlighted by colored brackets. 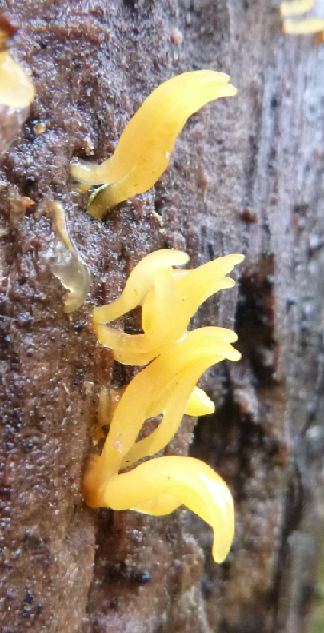 Horn-like jelly fungus on old tree trunk on Big Fir Trail. The fungi at TCSNA are diverse in size, color, structure and lifestyles. If you want to get more information about some of the fungi at TCSNA, there is a great 3-ring picture notebook (Mushrooms of Tryon Creek) by Marilyn Anderson located in the library in the Kraft Room at the Tryon Creek Nature Center. She has pictures of a large number of fungi found at TCSNA, some of which I’ve never seen myself. As fall sets in, it is a good time to get familiar with the many faces of our fantastic fungi.